Remember your childhood? You knew how to have fun; you used to go out and play with your friends all day. 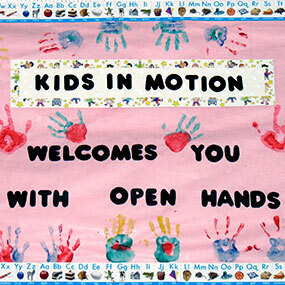 At Kids In Motion, we provide a supervised environment that nevertheless evokes those same feelings of fun; feelings you want your own kids to experience. The children who attend our program enjoy the flexibility we offer; we encourage group activities while allowing the kids to pursue their individual interests. We know that structure is necessary for safety and control, and we allow the children to help create that structure. We have found that, with our guidance, the kids' participation in shaping the program gives them a sense of ownership and a spirit of responsibility that help keep the program a safe, flexible, and nurturing place to be. The activities we offer include homework help, soccer, kickball, capture-the-flag, arts & crafts, cooking, board games, riding bicycles & scooters, playground time, and exploring the creek. Summer activities also include swimming once a week, off-site bike rides, and field trips. Buy some t-shirts designed by some of our kids at www.zazzle.com/kidsinmo!